The founder of Karuna, Linda Wang, was raised with Taiwanese culture playing an integral role in her daily life. Growing up she observed the customs and traditions practiced by her parents, her mother’s skincare regime and the regimes of other Asian women. As a child Linda suffered from eczema, the doctor prescribed an ointment, wrapped the rash in plastic wrap and the rash healed in days. When visiting Asia she discovered sheet masks and realised they would work in the same way. These experiences served as the inspiration for Wang to launch her own skin care collection, the Karuna Products line. 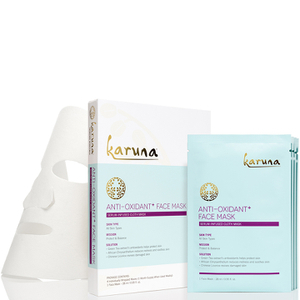 Karuna’s range of masks will allow you to take your skin care regimen to the next level through their quick and easy no rinse masks. These masks are made of a natural biodegradable wood pulp cloth which helps give your skin the best possible results. 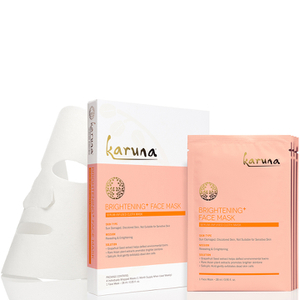 Karuna combines traditional Eastern Wisdoms with modern Western knowledge to create an innovative product line targeting specific skin concerns with highly specialized ingredients that are custom-blended with care and expertise. Karuna’s mask and serum combination delivers specific results through innovative delivery systems to give an instant, visible pay off. The biodegradable wood pulp natural cloth retains 50% more moisture than synthetic material and forces pores to fully absorb nourishing ingredients that help create instant results. The mask formulas contain a blend of ingredients that are used in traditional skin care remedies from all over Asia, targeting concerns such as hyperpigmentation and acne. The Karuna product line will add an element of luxury to your skincare routine to get that spa feeling from home. 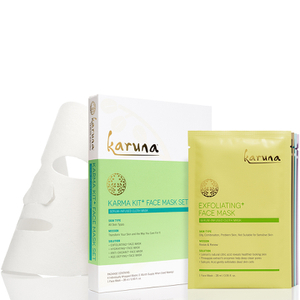 Application of Karuna masks is clean and easy. Simply remove the cloth mask after the directed amount of time and massage the remaining serum into the neck and hands without rinsing. Each Karuna mask is formulated with a different skincare need in mind to allow you to cater your routine to suit your skin's unique needs. Use once a week to improve your skin's health and appearance. *Karuna HydratingTreatment Mask* alleviates symptoms of dryness as it exfoliates to re-boost dehydrated and dull skin. The key ingredient in this mask is Natto, a type of Japanese soybean that contains nutrients which aid the restoration of the natural moisture barrier on the skin and exfoliates dry tissue to leave it hydrated, protected and smooth. The one step, no-rinse formula continues to absorb into the skin long after use. 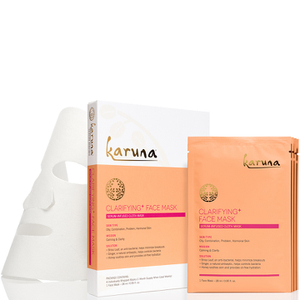 *Karuna Clarifying Mask* is ideal for treating acne, enlarged pores or an oily shine and uses a blend of natural ingredients to soak up excess oils in the skin. This all natural one-step mask consists of a blend of honey, ginger and Shiso, a leafy plant native to Japan. This mask will calm and clarify the skin to leave it soft and hydrated. *Karuna Age-Defying Mask* is perfect for reviving and revitalising tired skin. With hyaluronic acid to help infuse moisture, Wild Yam to increase collagen renewal and Elderberry Extracts to improve elasticity the age-defying mask will give you visibly softer and plumper skin.